"THE HISTORY OF THE JANUS MASKS"
A.K.A. - "THE THEATRE MASKS"
A.K.A. - "THE COMEDY TRAGEDY MASKS"
Twenty-five hundred years ago, two thousand years before Shakespeare, Western theatre was born in Athens, Greece. Between 600 and 200 BC, the ancient Athenians created a theatre.The two masks are the symbols for THEATRE. They are the comedy and tragedy masks that were worn in ancient Greece during the golden age, around 500 - 300 BC. 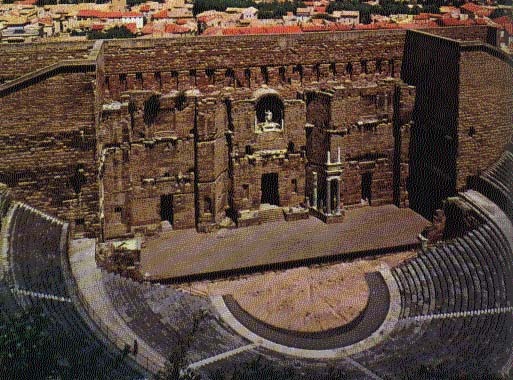 The golden age was the first time that plays were written and performed. Plays were written in honor of the god Dionysus, the god of fertility and procreation, and were either Comedies or Tragedies. All the actors were male, and they all played multiple roles, so a mask was used to show the change in character or mood. with voice and body language, since they couldn't use facial expressions. The two masks are now used as the symbol for theater, in memory of its origins in ancient Greece. According to legend, sometime bwtween 600 and 675BC, a man named Thespis of Attica added an actor who interacted with the chorus. This actor was called the protagonist, from which the modern word protagonist is derived, meaning the main character of a drama. The name Thespis has achieved immortality in theatrical jargon - 'actors' and 'Thespians' are synonymous. 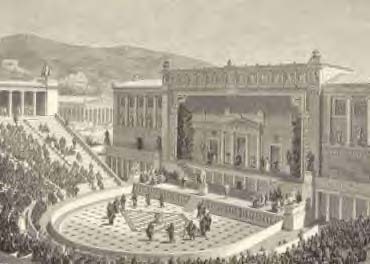 Plays were performed outdoors, in daylight, before audiences of 10,000 or more at festivals in honor of Dionysus. Masks played an important role in Greek drama. They gave the actors the ability to easily play more than one character in succession with a simple change of mask. They conveyed a kind of static emotion that must have created an atmosphere very different than our modern theater. The masks and dress were usually highly stylized and exaggerated making the characters easy to identify even from a great distance. Ancient masks were made from clay, wood or linen. With the attached wig covering the entire head and they had wide open mouths for easier speaking. 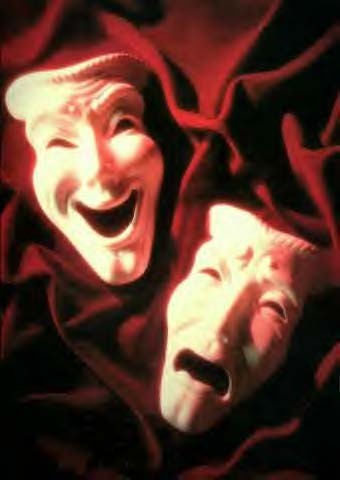 The traditional "Comedy Tragedy" masks are used now as a universal symbol for drama. being joyous, Bacchic revelry, and a dark, sorrowful harvest. Tragedies were traditionally very musical, but Comedies were very different. When in a comedy, characters were often dressed very scantily or not at all. Later in the 4th century BC comedy characters wore more respectable clothing.